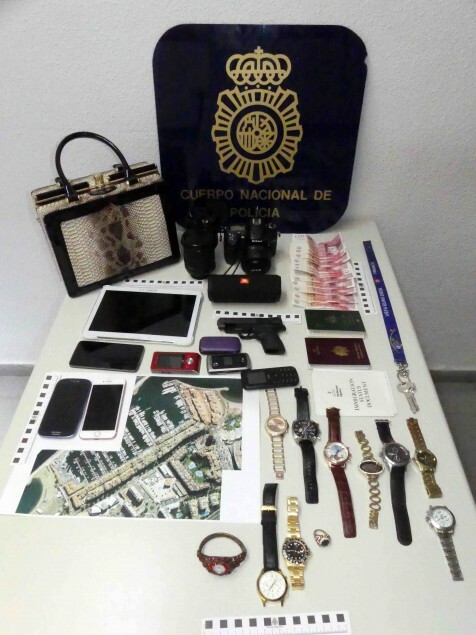 Policía Nacional has dismantled a criminal gang which exclusively targeted wealthy tourists in Marbella. Six Algerian men, between 23 and 33 years old, were arrested for their alleged involvement in a robbery and an assault of a police officer. Four of them were arrested in Marbella last Saturday 22nd of July of 2017 after they successfully stole a watch worth €24,000. The rest of the gang was found a few days later in a hotel room in Fuengirola. The police found 10 watches, six latest generation mobile phones, cameras, computer equipment, 650 British pounds, a vehicle, and jewelry. The items were worth €400,000. The main targets of the network were foreign tourists, with a certain financial status, on vacations in Puerto Banus, Marbella. The modus operandi was very simple, they chose a victim, usually, older or intoxicated tourists, two of them would tackle them from behind and then choke them until they became unconscious. This immediately solved fifteen robberies committed in the Marbella area. Those arrested have been placed in prison awaiting trial. If you have been robbed with this modus operandi, we recommend you to go to the police office to press charges and to see if any of the items recovered belongs to you.